David Garza grew up in New Orleans, La. He tutored his peers in high school and college, and from 1992 to 1994 served as a high school math and science teacher for the Peace Corps in the Grenadines and St. Vincent. He says that while many of his colleagues in graduate school resented their teaching assistant duties as a requirement for their degree, he loved the time he spent with students. 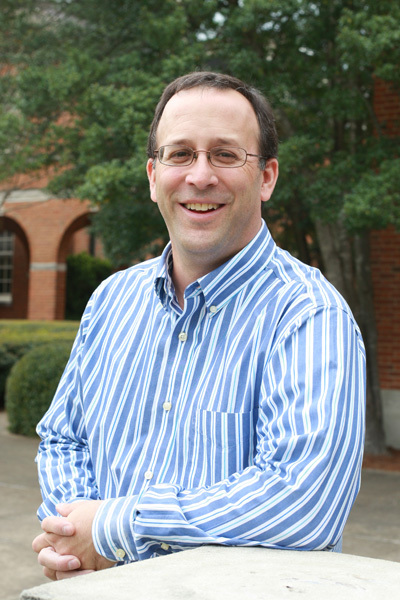 Garza joined Samford's faculty in 1998. His passion for teaching chemistry here relates to to the asking of questions and eventually finding the questions no one has yet answered. He also is thrilled to see chemistry students learn to predict based on knowledge and test knowledge in the lab. “Chemistry bridges the gap between the abstract ideal of theories and practical use,” Garza says. Garza currently teaches General, Organic and Biological Chemistry, Foundations of Chemistry, Fundamentals of Organic Chemistry, Quantitative Chemical Analysis, Inorganic Chemistry, Senior Seminar, all chemistry lab courses, and Scientific Inquiry. Outside of teaching chemistry, Garza is an active outdoorsman with a love of camping, hiking, backpacking and canoeing. Reger, D.L. ; Garza, D.G. ; Rheingold, A.L. ; Yap, G.P.A. Synthesis and solid-state structure of [HB(3,5-Me2pz)3]GaFe(CO)4: a compound with a short, two-electron Ga(I)? ;Fe dative bond. Organometallics 1998, 17, 3624-3626.